A church spokesperson has said the entire wooden interior of the Notre Dame Cathedral is burning and will likely be completely destroyed. 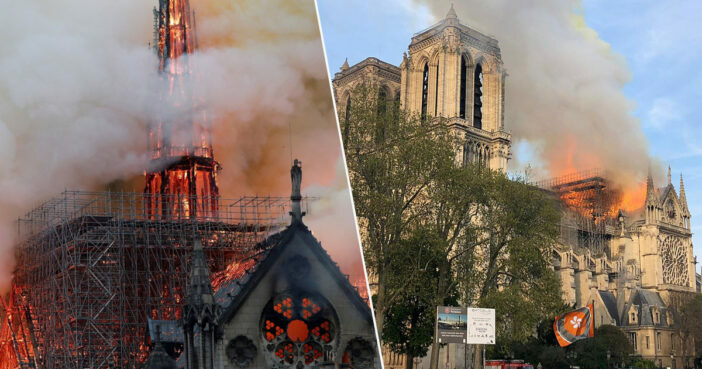 The spokesperson has informed French media the entirety of the 12th century landmark’s frame is burning following the collapse of the iconic spire. Deputy mayor of Paris, Emmanuel Gregoire, has described Notre Dame as having suffered ‘colossal damages’. The emergency services are now attempting to salvage priceless art and artifacts which are stored inside the cathedral. French President Emmanuel Macron has postponed a planned speech tonight due to the blaze in central Paris, a Élysée Palace spokesperson said. The Paris prosecutor’s office have reportedly now started an inquiry into this devastating fire. Notre Dame Cathedral has stood since 1260, having been modified throughout the centuries. It’s provided rich inspiration for writers such as Victor Hugo, and is regarded one of the most culturally significant and instantly recognisable buildings on the planet. Approximately 13 million people visit the Notre Dame Cathedral every year, with an average exceeding 30,000 visitors each day.